Glastonbury Mysteries at Imbolc An Imbolc pilgrimage retracing the steps of Brighid herself. Incorporating a story of strangely revealed magic. On 1st February 2019 I attended a midday ceremony at Chalice Well in Glastonbury to mark the festival of Imbolc. It is exactly 24 hours ago that I was sitting by the well with my partner Fleur with snow falling gently all around – an Imbolc blanket. Perhaps eighty to ninety of us all together, huddled round the wellhead with the beautiful vesica pisces symbol on the cover of the well. This symbolises, amongst other things, the womb, and was associated with Venus the Goddess of love in earlier times. A very apt symbol for Imbolc, with its associations of femininity and birthing, embodied in Brighid- the feminine deity particularly associated with this time. Bridget, Bride, Brighde and Bridie are among the variations on her name. Having personally celebrated Imbolc for over a quarter of a century, Brighid has come to hold a very special place in my heart. As a Pagan goddess, she is honoured for embodying the triple aspect of Poetry, Healing and Smith-craft. What is particularly striking is the contrast between the qualities of kindness, compassion and gentleness, and those of warrior woman, strength and power – a beautiful balance. This is fully reflected for me in the flower that best represents and symbolises Imbolc – the snowdrop. In order to emerge through the frozen ground at this time, it needs to forge deep roots and emerge through ice and snow like a focused arrow head, with full force and purpose. Yet in its flowering is reflected the utter tenderness of existence. Try looking carefully and intently at the open flower of a snowdrop blossom for several minutes. I predict you will be incredibly moved by the vision of sublime tenderness embodied and reflected before you. As we left Chalice Well, an old friend of mine who lives in Glastonbury posed me a question. He reflected on the historical evidence that the site of Brighid’s Mound had been a place dedicated to the Goddess, tended by women and Nuns, yet all the bodies excavated nearby had been male. I set off with that strange paradox in my mind and with humorous images of all those unworthy men arriving at the gates of Avalon, ending up on the wrong side of the gatekeeper’s question; ‘How do you best honour the feminine?’. Our guide led us, carrying a large flag standard bearing the symbol of the Glastonbury dragon upon it. As we walked, I chatted with her about the history and archaeology of the locality. She clearly knew much of the story of this place and had been intimately involved with the preservation and care of Bride’s Mound since the mid 1980’s. I reflected on a story I had read about many ears ago, which spoke of Glastonbury egg stones. 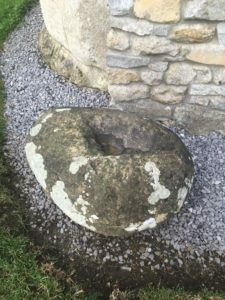 I remembered reference to one such stone in the Abbey grounds being ‘of more weight and value in terms of wealth than that of all the assets of the Abbey in its heyday’. I presume that reference to be in terms of spiritual wealth and weight. I am familiar with that stone. I am also familiar with a second egg stone on the side of the Tor. Both of these stones are of significance and value to my own spiritual path in that they somehow embody the essence and energy of ’the old ways’, particularly in relation to the Divine Feminine. I went on to tell our guide about a third Glastonbury egg stone which I understood to be in the Beckery region of the town, but I didn’t know where. She said that whilst she knew about the first two egg stones I spoke of, she had never heard reference to a third stone. I left it there. We continued following one of the pilgrim routes to the site, which culminates in a walk along a ridge beside the river Brue. Half way along, there is a stone dedicated to St Bride which Wesley Tudor Pole (the re discoverer of Chalice Well ) commissioned to mark the spot where his sisters are reputed to have found a blue bowl associated with the Goddess and the Grail, apparently buried by a man called Goodchild in the 19th century. This was to mark what he considered to be Bride’s Well, following a dream he had. It seems the stone has been moved from its original more central spot in the field to its current place by the river, because the farmer who worked the field found it ‘got in the way’. As a group, we continued on our pilgrimage; twenty nine of us now strung out in a line in respectful reflective silence. We made our way toward the area known as Bride’s Mound, where the chapel of Brighid originally stood. 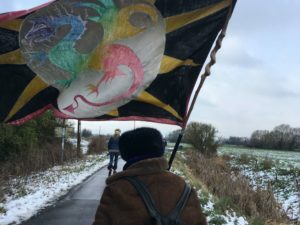 With our dragon banner fluttering fiercley in the biting winter wind and the snow crunching beneath our feet, it made for quite a grounding, primal experience. We had been told how early pilgrims would have made their way across the Somerset levels from the Polden Hills in the distance, via ancient boarded trackways constructed over the waters, believed to date from as long ago as the Bronze Age. The track culminated at a fording or bridge place over the river Brue, which I have since learned was called ‘Pons Perilous’, probably because it would have been treacherous to cross as it was often underwater, as much of the Somerset levels were. I believe the modern day name is Pomparles bridge – still retaining the essence of its older name. In legend, it is the spot from which Bevedere, one of King Arthur’s Knights, is reputed to have thrown the sword Excalibur into the waters of the river Brue, after Arthurs death. It would make sense for Arthur to have returned to this resting place, carried in a low lying barge or boat after his death, as the description given in the legends apparently fits with the geography and situation of Beckery. If one also considers Arthur’s illuminating experience at Brighid’s Chapel earlier in his life, which I describe a bit later in this article, then it makes even more sense for his body to have come to rest here . From the site of the old river crossing it is only a couple of hundred yards to the slight rise in the land and a ridge at the site of the old chapel of Brighid. What feels astounding to me, is to stand in a spot where the sacred ‘entry to the Isle of Avalon’ was marked for hundreds of years. Who knows how long ago in time those ancient pilgrim routes stretch back. Given my work with Song and ‘Dreaming Tracks’ I suspect it could well be thousands of years. But no matter. The spell lingers for those inclined to pause. In common legend, it is said that Brighid herself, travelled over from Ireland in 488AD and spent around ten years at this site now dedicated in her name. Before her visit it was apparaently a chapel dedicated to Mary Magdalene. There is evidence to suggest three chapels on this site, each one overlaying the one before. The first a wooden structure in Saxon times, around when Brighid was said to have visited. Then a small stone chapel built a couple of hundred years later. And finally a larger stone church, built in Norman times, more akin to the churches we are familair with in our landscape. Apparently the larger chapel grew out of the need to accommodate some relics that Brighid had left behind, along with all the extra pilgrims drawn to visit as a direct result. These relics were apparently her pen and a pouch which seemingly served as an ‘ink well’. There is no sign of any of the structures now. However, excavations have revealed the triple chapel history and mystery of the site, along with the revelation of seventy skeletons in a cemetery next to the site. I had been posed a riddle as I had left Chalice Well. Now I asked our guide how come all the buried bodies found at the site, had been male, while the chapel and those who originally tended it were female. Her answer was as intriguing as the question. She suggested that in the time that the chapel had been tended by women, no burials took place there, and that the cemetery marked a later phase when male priests came to preside over the chapel. Who knows? How interesting to speculate. After first drafting this article I have spoken with my learned friend Prof Ronald Hutton about this: Whilst it appears there is no evidence to suggest that the site was ever tended by women, recent dating in 2018 of two of the male bodies, has revealed that they were indeed concurrent with the time that Brighid is said to have visited, confirming that the site was active at that time). 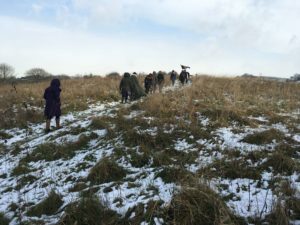 We conducted a short ritual in circle, at Brighid’s Mound, with a small contained fire, where we offered our dedications: To ‘release’, to ‘new beginnings’ and to the ‘Goddess Brighid’ at Imbolc. This was rounded off with a toast of primrose wine which we all shared between ourselves and the earth. It felt beautiful to be marking this special time at this sacred place of Brighid. Potent and important. What is fascinating to consider, is that all the pilgrims arriving at the Isle of Avalon, who came to this place, apparently spent twenty four hours resting and reflecting in sanctuary, before proceeding to Glastonbury Tor. Brighid’s shrine at Kildare on the Isle of Eire still bears an ‘eternal flame’ which burns all year round. Historically nineteen female guardians protected and tended the flame. Nineteen being the number of years in the metonic cycle when moon and sun complete their intimate dance together. The modern priestesses of this shrine – from the Brigidine Order ‘Solas Bhrde’ in Ireland, visited Bride’s Mound in Glastonbury to conduct a ceremony as part of the Goddess Conference in 2005. Apparently there was a traditional pilgrim route from Ireland which traversed the Bristol channel to Bridgewater and thence up through Somerset to Glastonbury – Somerset literally meaning ‘the land of the Summer people’, since in Winter it was mostly underwater. It is likely that monks travelled over from Ireland on pilgrimage up until the time of Henry VIII and the dissolution of the monasteries. One of the possible origins for the name Beckery may be ‘little Ireland’ (Gaelic ‘Becc-Eriu’) due to its connections with Ireland. It may just as likely derive from the old English ‘Beocere’ meaning ‘Bee-keeper’s Island’, Beckery being one of the seven historical Islands of Glastonbury. Just as Henry VIII marked a major transition in the religious journey of these lands, so St Brighid’s chapel figures prominently at another juncture in the transition of our traditions. For it is related that it was at this very spot, St Brighid’s chapel, that King Arthur had a dream in which he adopted a new standard and symbology for his flag. From now on it would carry the image of the Virgin and Child, whereas up until this point his standard bore the symbol of the dragon. I see that as likely to be a reflection of changing times and the supplanting of the old ways by the new – Pagan ways either ‘falling to’ or being ‘incorporated into’ (depending on your viewpoint) the emergent Christian tradition. Yet here we are now- at another possible juncture, where the old ways re-emerge and the Dragon standard flies afresh. The significance of our intimate relationship with nature’s dragon lines coming back into consciousness after a sleep of around two thousand years. After our beautiful little ceremony and ritual at the site of the chapel, we wandered off in smaller groups heading back toward Glastonbury Town via a shorter route through Beckery which these days is a motley hotch potch of scrap yards, coal stores, dilapidated warehouses and deserted workshops, alongside the town sewage works. It has become the neglected and less visited end of town; largely forgotten and un-loved. As we headed off in our small group, we chatted with a young woman who hailed from Wisconsin. A parent and grandparent of hers were apparently descended from a tradition of Welsh witches and she had been named accordingly. As we walked through the decrepit and somewhat depressing industrial and post industrial landscape, I related the tale of the Glastonbury egg stones along with the fact that our guide hadn’t heard of a third stone. At which point, the young woman quite calmly and matter of factly pointed to a neglected patch of land we were walking past, declaring “oh its over there between those three trees” (which were inaccessible due to masses of bramble and wild growth). I stopped – unsure whether it was her joke, a cosmic joke, no joke at all or all three of those weirdly combined. Surreal as it turned out, she had the answer. How come an individual from several thousand miles away could know something local experts of the vicinity had not the faintest clue about? She proceded to relate to me how she had come to Glastonbury some years before on a course with Janet Farar – of the Alexandrian Tradition of old magic. Janet had taken her there to specifically show her where the third egg was to be found. How strange it felt to be literally walking past the very spot when the information came to light; what odds on that for multiple synchronicities? Yet here we were. It was no joke. Rather it felt like a touch of supreme magic – a scattering of faery dust – within an unpromising environment. I can only imagine Brighid smiling tenderly, gently tickled and amused at the picture of me stopped dead in my tracks- gobsmacked and inspired in equal measure. The Goddess certainly moves in mysterious ways. What I have discovered since, is that place names ending in ‘ON’ -such as Avalon -are associated with significant/sacred Stones. With gratitude I dedicate this writing to Fleur, without whose gentle encouragement and inspiration, I would neither have been part of this particular pilgrimage nor penned this piece. Postscript – or possibly prescript. Years ago, possibly fifteen or so, around the time I discovered the writing about the three egg stones, I had a dream. That in itself is significant, for I barely ever remember any dreams. 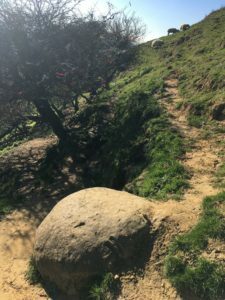 In this dream, the three egg stones are being restored to their original and rightful place – on the top of Glastonbury Tor. The sense of the dream was that they had been rolled off or displaced from there at the time the old ways of Avalon were being dissolved. Maybe the stones don’t need to be literally ‘back on top of the Tor’. Maybe it is simply a symbol of something already happened or happening. Yet in my own minds eye, the three sacred egg stones – embodied in the name Avalon – necessarily need to be back atop the Tor with the Dragon energy protecting them, for us as a species to have any chance of correcting our diversion into the dissolution of nature. Our very survival depends on a healthy alignment to Spirit – the Divine Feminine alongside the Divine Masculine. The metonic cycle embodied in the the tending of Brigid’s flame, reflecting a healthy balance between Moon and Sun, between Female and Male energies. It is for each of us as part of our life’s purpose, to find this magic within.